Anyango Mpinga is a Nairobi-born designer who explores the idea of sexiness for women of different sizes and body shapes with an underlying unapologetic, statement aesthetic. Her background is in media studies, having graduated with a B.A. in social communication and a major in radio production, and has experience working as a radio presenter, an event and public relations manager. 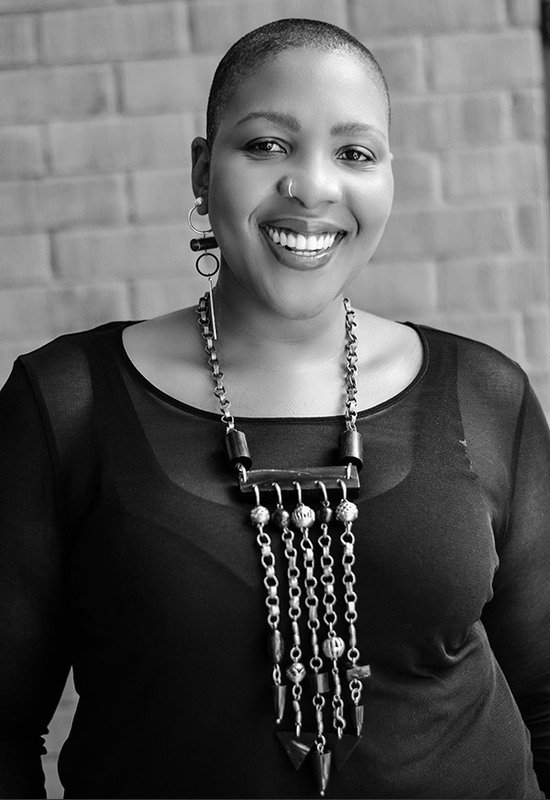 In 2010, she was the project director for the first edition of Hub of Africa Fashion Week in Addis Ababa. This communications experience paved the way for her journey as a fashion entrepreneur and has supported her as she works to carve out a niche in the fashion industry. Back in 2011, she audaciously started Kipusa – her first clothing line– which blossomed into her brand Anyango Mpinga in December, 2015. Her aesthetic is a balance between androgyny and bohemian femininity; with the objective of creating pieces that are authentic, tell a story, and connect the wearer to the narrative of each collection. Not only do her tailored pieces have an ethereal quality- oftentimes reminiscent of the romantic victorian age while maintaining a sophisticated, boyish edge- she genuinely cares about high fashion’s impact on increasingly globalized societies as well as the physical world. Her collections, from “Proverbial Dreamer” (2017), “Literary Disenthrallment” (2018) to “Phonology” (2019), encapsulate her harmonization with the evolution of African fashion- namely how it’s finally starting to garner the world’s attention and respect. Anyango’s daily under-takings are often inspired by the teachings of the Baha’i Faith. Her involvement with social activism is laudable, not only in how openly she speaks about uncomfortable yet ineluctable social and environmental issues, but also in her priority to source materials and labor with the utmost transparency and sense of responsibility. Her initiative, Free As A Human, opens up a pressing dialogue that is long overdue. It is an anti-human trafficking initiative, backed by notables such as Gloria Steinem, which currently supports Kenyan based NGO Awareness Against Human Trafficking (HAART Kenya), donating profits from the sale of Free As A Human merchandise towards healing and supporting young female survivors of trafficking. She believes that other stakeholders in the fashion industry should confront issues around the use of child and forced labor within the manufacturing supply chain and surmises that such accountability layers meaning onto her work; it lends creatives like herself leverage to affect social transformation. She is a proponent of “slow-fashion” to counter the idea that clothing and fashion are merely seasonal and dispensable. In 2014, she was selected as one of the top finalists of FA254’s “African Designers for Tomorrow” competition. Anyango was nominated for the designer of the year award at the Kenya Fashion awards in 2015, and received the She Trades Collective (ITC Geneva) international design award in 2016. In 2018 she was awarded Designer of the Year at the Swahili Fashion Week. She has been profiled several times in Vogue Magazines, the book “Mtindo-style movers rebranding Africa” and “Not African enough,” Elle Magazines, the Irish Times and Man Repeller just to mention a few. Anyango strives for her work to mean something to wearers of her pieces. Her intentionality with the narrative of her work from start to finish is evident in the integrity of her clothing- a testament of her love for art in motion.